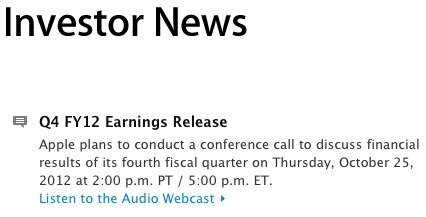 Apple today updated its investor relations page to note that it will announce its earnings for the fourth fiscal quarter (third calendar quarter) of 2012, as well as results for the full fiscal year, on Thursday, October 25. The earnings release typically occurs just after 4:30 PM Eastern Time following the close of regular stock trading, and the conference call is scheduled to follow at 5:00 PM Eastern / 2:00 PM Pacific. The release will provide a look into the strength of iPhone 5 sales in the first weeks of availability. Apple reported weaker than expected results three months ago on lower-than-expected iPhone sales, and the company provided guidance for the fourth quarter of fiscal 2012 expecting revenue of $34 billion and earnings per diluted share of $7.65. If Apple meets that guidance, the company will log more than $150 billion in sales for fiscal 2012, more than $40 billion higher than in 2011. We do not want to hear about investor news right now. We want to know WHEN ARE THE GOING TO START SHIPPING MORE iPHONE 5's!!! Speak for yourself. Some of us are interested in knowing. Why are Apple earning notices frontpage newsworthy at MacRumors? "MacRumors - news and rumors you care about"
See top of this webpage. Quarterly earnings is major Apple news, even if it doesn't have to do with a specific product or rumor. Many of us mark our calendars for these events. I myself had the date wrong by one week. So, I appreciate the correction. Hopefully Tim and Peter get asked wtf is going on with their iMac lineup which hasn't been updated in 517 days. Time to see if they bounced back from Q2's earning miss (yes, I know the numbers were phenomenal, I even said so myself on quite a few occasions). Wondering if this will be yet another weak quarter though what with the new iPhone only showing up for the last few days of it. I'm sorry, but I'm still mystified about why they have to "bounce back" from earnings that exceeded their own guidance. Just because the analysts' predictions were not met doesn't mean they didn't hit their earnings. Apple gave guidance, and exceeded it. That, in any reasonable logic is not a failure to meet earnings. Because it DIRECTLY affects whether or not Apple will make more or less of your iPhone/Mac in the future. Personally, I want MORE of these stories and less of the "mockup" stories. There are many investors here. I expect the 4Q earnings to be weaker than expected (by others), so I'm holding off my planned buying. Sell your stocks before the earnings. It always will be a disappointment and the stock will drop. Yes I was curious about this too. Apple's financial year starts with Q1 in October - December. Apple's fiscal year runs from October to September, not uncommon for corporations. As a result, their fourth quarter matches up to the third calendar quarter. The 25th is a Thursday just as its mentioned in Apple's actual release, not a Tuesday as the MR post describes.